Not much went right in an opening loss to Dallas, but Eli Manning is confident the team will bounce back. 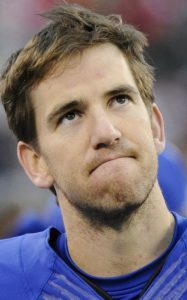 EAST RUTHERFORD, N.J. — Fourteen seasons in the NFL have taught Eli Manning not to make too much of one game. Sure, the New York Giants’ offense was pathetic in a season-opening 19-3 loss to the Dallas Cowboys on Sunday. The statistics screamed bad game: three points, 233 total yards, 35 on the ground, 53 total plays, just under 26 minutes of possession, three sacks. It was awful, and even missing leading receiver Odell Beckham Jr. with a sprained ankle was no excuse for such a performance. There was blame to go around a couple of times, from the offensive line to the wideouts who could not get open. Manning was quick to answer when asked if he was worried about the offense, which also struggled last season despite an 11-5 record. Manning said the Cowboys had some new wrinkles for the game. The defensive backs divided the field into quarters, a scheme he said he had never seen from a Rod Marinelli defense. However, most of the problems the Giants had were self-inflicted. The line didn’t give Manning time to throw. There were missed assignments among all phases of the offense and a general lack of execution. Manning even admitted things could get worse, although he expects improvement against the Detroit Lions (1-0) on Monday night. Getting a healthy Beckham back would certainly help. He has not practiced since being hurt in a preseason game on Aug. 21. PATRIOTS: Dont’a Hightower (sprained knee) and Danny Amendola (concussion) were absent from practice on Wednesday. Amendola’s absence was the bigger concern because it indicated that he was still in the early stages of the concussion protocol. This is the seventh day that he has been monitored for the head injury. Vincent Valentine (knee) was absent again. He hasn’t practiced since the preseason. TEXANS: Houston linebacker Brian Cushing was suspended for 10 games for violating the league’s performance enhancers policy. It’s the second time Cushing has been suspended; he missed four games in 2010 under the same policy, testing positive for a fertility drug. Cushing had won 2009 Defensive Rookie of the Year, an honor which was jeopardized by the suspension. He kept the award after a revote by The Associated Press’ awards panel. Currently in the NFL’s concussion protocol after being injured in Houston’s opening loss to Jacksonville, Cushing will be eligible to return on Nov. 28. Cushing has had a checkered career since his sensational rookie season. Injuries curtailed the 2012 and ’13 seasons, when he got into a total of 12 games. He’s never come close to matching his first-year production of 86 tackles, 47 assists, four sacks, four interceptions, two forced fumbles and 10 passes defensed. PANTHERS: Graham Gano officially won the team’s kicking job after Carolina waived rookie Harrison Butker, the team’s seventh-round draft pick.